Like Jolly Awesome? Click here to view the entire range. Your morning coffee has never been so magical! With this unicorn styled ceramic mug from Jolly Awesome, you will be woken up by both mystical unicorn powers and caffeine! What could be better? It is brilliant at bringing that quirky and eccentric edge into your home, and it makes a great gift for someone else. 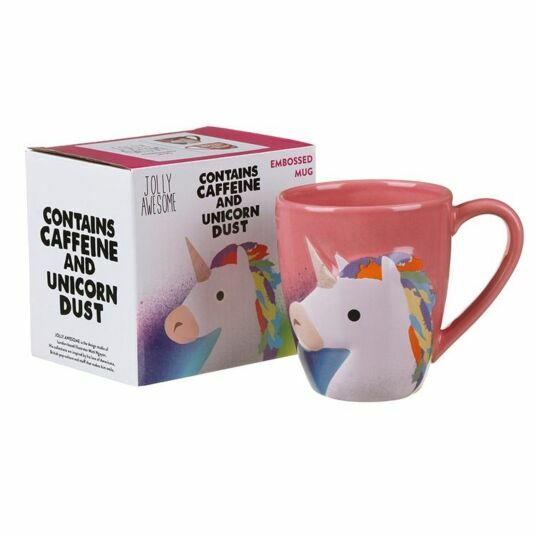 The mug is a beautiful pink colour and features the words: ‘Contains Coffee and Unicorn Dust.’ On the other side there is an awesome graphic of a unicorn, displayed in majestic wonder and with rainbow colours radiating beautifully from the lovely grey unicorn. It brings an instant smile to your face each time you gaze upon it, with the mug holding 325ml of your favourite hot drink. It is perfect for housewarmings or birthdays and any other time that a bit of adorable magic wouldn’t go amiss.